Fractional lasers have been the gold standard when it comes to improving skin texture and tone for the past decade. If you were concerned with acne scars, fine lines, rough skin or pigmentation, then fraxel was your go-to. But the hefty price tag (roughly $1,200 per session, with 2-3 sessions recommended for optimal results), one week of downtime (hiding out at home is recommended while you look like a burn victim), and possible side effects, including: infection, hyper-pigmentation, and herpes outbreak (if you’ve had cold sores before) have many looking into alternative options. One such treatment that offers skin smoothing and tightening benefits without the downsides of fraxel is micro-needling. While it sounds frightening having microscopic needles puncturing your face, the hour long treatment is relatively gentle. Numbing cream is applied prior to minimize pain and the needles are literally microscopic, so wounds close up within twenty-four hours, says Dr. Tansavatdi. Meaning after one day of downtime you’ll be back at work and no one will know you had anything done. But as a general rule says, “With anything that has less downtime it requires more treatments to get the results you want. Whereas something that has more downtime you will see faster results.” Four to five treatments of micro-needling are recommended (averaging $150-400 per treatment), but vary depending on a patient’s desired outcome. “Most of my patients tell me they start to see skin tightening and smoothing within the first week post treatment. But I usually tell my patients within 1-2 weeks you’ll notice improvements with continued tightening over the course of six weeks,” says Dr. Tansavatdi. And if you’re looking to supercharge your results, microneedling can be done in conjunction with platelet rich plasma (PRP). When done together the treatment is known as the “vampire facial”; made famous by Kim Kardashian a few years back. “We know there are stem cells in plasma. So the goal has been to take the patient’s own blood, spin it in a centrifuge and get the highest concentration of stem cells and apply it after micro needling while the skin is still open. This way we can use the channels we created with the needles to drive the PRP in,” explains Dr. Tansavatdi. The result – increased wound healing and further stimulation of collagen production. 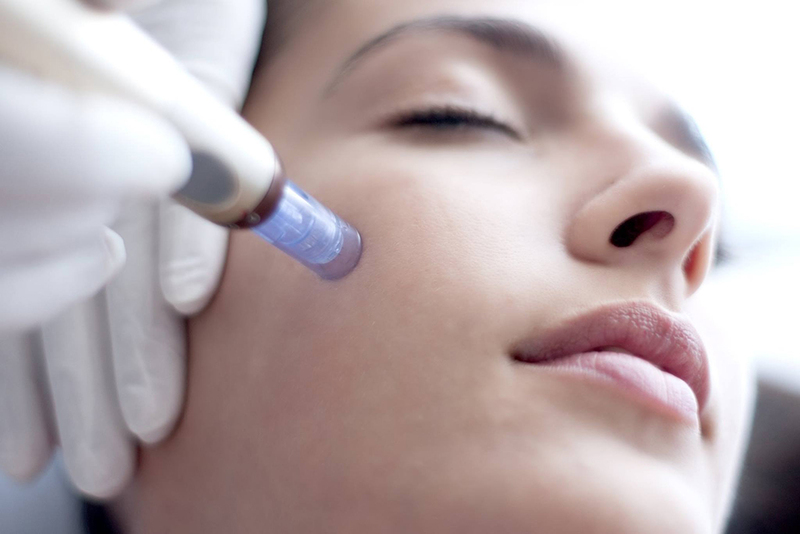 Whereas microneedling is recommended once a month for four to five months, PRP treatments should be spaced out every six months with results lasting up to a year. “You get the benefits of the microneedling portion pretty immediately, but as far as letting the collagen grow from the PRP it can take up to six months. That’s why I don’t retreat with the vampire facial portion until six months since they may not even need it,” says Dr. Nazarian. Disclaimer: Any information in the publications, messages, postings or articles on the website should not be considered a substitute for consultation with a board-certified dermatologist or plastic surgeon to address individual medical needs. Your particular facts and circumstances will determine the treatment which is most appropriate for you. And the outcomes. To read more about getting rid of acne scars with fractional lasers read here.